What is the Cerreta Candy Company? The Cerreta Candy Company is located in downtown Glendale, Arizona. It's a one-of-a-kind family business and is a source of pride for the greater Phoenix area. Generations of Cerretas have participated in the family enterprise that has been pleasing Arizonans and people all over the western U.S. with their high-quality chocolates and candy products. Cerreta's is more than a candy store. Take some time to look around at the murals depicting various aspects of candy production. All the characters shown in those murals are real people who work or have worked at Cerreta's. The production area and the retail store are all in the same building, and it is an open layout. That means that when you stop into Cerreta's to get chocolates, or nuts, or their special popcorn, you'll also see the staff at work making all that wonderful stuff. Joe Cerreta is one of the third generations of brothers managing operations at the Cerreta Candy Company. The fifth generation of the Cerreta family is just now being introduced to the family business. Fun Fact: Jim Cerreta Sr's father-in-law, the original Cerreta's candy maker, was the first in the U.S. to wrap soft candy, and also the first to wrap candy in cellophane, rather than waxed paper. Cerreta Candy Company makes tours available to the public, and the tours are free! Advance reservations are not required unless you have a large group. Come in and learn how the chocolates are made, how they mold chocolates into unique shapes, and how the Cerreta family operates this unique Arizona business. Tip: The number of people on each tour varies, but it is not unusual for there to be 40 or more people participating. Expect lots of young children! The tour takes about 30 minutes. There's very little walking associated with this tour, and if you need a respite from standing there are chairs available. How Do They Make the Chocolate? To make the varieties of chocolates that you can buy at Cerreta’s, they use a distinctive chocolate that is custom blended exclusively for them. The company that provides the chocolate from which Cerreta makes its chocolate products is Guittard Chocolate, one of the foremost suppliers of fine chocolate to confectionery professionals. How does Cerreta's make all the types of chocolates that they offer to their customers? You'll have to take the tour to find out! Tip: I've heard (but I don't really believe it!) that there are some people who aren't fond of chocolate. If chocolate isn't what you crave, there are also nuts, popcorn and other delicious products made at Cerreta's. Love chocolate but can't take the sugar? Try one of their sugar-free products. You'll be given the crust (chocolate), the cheese (white chocolate), a large variety of pizza toppings from which to choose -- or use them all! -- like pepperoni, olives and veggies (nuts, sugar drops, M&Ms, and more). Be careful not to eat all the fixins before they get onto the pizza! Tip: Cerreta's provides your own Chocolate Pizza Box for transportation back to your home. Cool the pizza down for a few hours before devouring. Have you ever ordered different toppings on the two halves of your pizza? Cerreta's has, and they allow two children to share one pizza and create it together. These pals had a great time making their pizza, but there was a bit of acrimony at the point of deciding who got to take it home to cool down in the refrigerator. At any particular time that you take the tour at Cerreta's Candy Company, there will certainly be people preparing some sort of chocolate treats or other candy item and you can watch the process. Many of the employees have been here for a long time, and some of them are second generation employees, since their parents worked here, too. Tip: If you happen to be at Cerreta's at a time when there's no guided tour, you can take a self-guided video tour during normal factory hours. TV monitors will explain all about Cerreta's business and process while the real chocolate candy production is going on before your eyes. 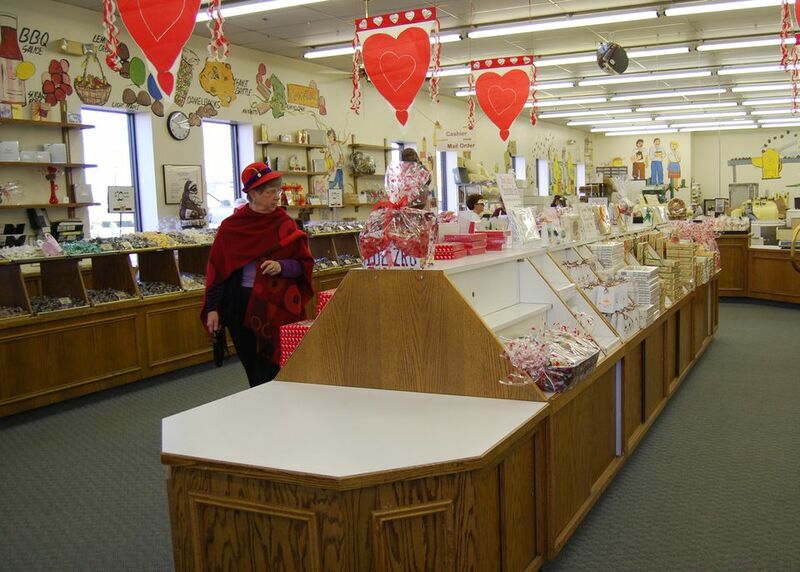 Cerreta Candy Company is the perfect place to find special gifts that say "Arizona." You might find cactus-shaped chocolates, Arizona gift baskets, or Camelback bars. Cerreta works with many Arizona companies that supply special ingredients for their products. Examples are Shamrock Foods dairy products, Arizona honey, and pecans from Green Valley. If you need a custom basket or other special product (a chocolate bunny the size of your grandchild? 88 chocolate piano keys?) chances are they can arrange to honor your request. Pictured above, Maricia Cerreta writes a custom message on a large chocolate heart. Cerreta's retail store is open Monday through Saturday. It is closed on Sundays and some holidays. The factory tours are offered Monday through Friday, twice per day. The tour lasts about 30 minutes. No reservation is necessary for individuals and families, but groups of 30 or more people should call for a private tour. If you can't get to Glendale to the main store and factory, you can find select varieties of Cerreta's chocolates at various local retailers and grocery stores. Cerreta Candy Company is located in Historic Downtown Glendale, Arizona at 54th Avenue and Glendale Avenue. Parking is free.